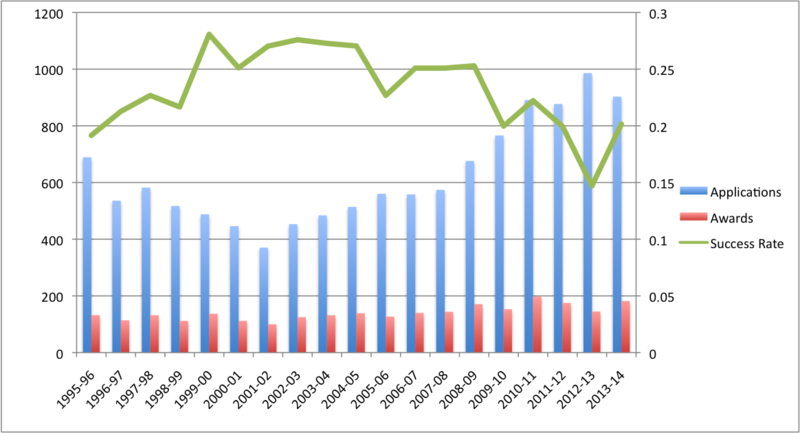 SSHRC Postdoctoral Fellowship Success Rates, 1995-2013. The above includes the 2013-14 results. We’re seeing a blip upwards in the success rate: there are more awards and a slight decline in the number of applicants. We’ll need a few more years to see whether this is a statistical hiccup or the beginning of a new trend. There might be some chill factor with the impending tightening restrictions around the number of applications, announced last summer. In any case, this success rate still is low: although it is an uptake, it is still lower than at any time between the 1996-97 competition year and the 2008-09 competition year. An additional thing to keep in mind: The “History Wars” have been getting a lot of attention lately, most recently due to the federal government’s decision to begin a “comprehensive review of significant aspects in Canadian history.” The specifics are best left to others, notably Active History co-editor Thomas Peace. I don’t want to get into it, but certainly there’s a tendency for the Conservatives to want to encourage scholarship that they find politically agreeable (military history, Diefenbaker) – just as there was for the Liberals (peacekeeping, multiculturalism). But keep in mind, as we discuss historians, that it’s quite frankly getting harder to do any kind of history as a professional undertaking. There’s a war on junior scholars in Canada. That’s being a bit provocative, I know, and the federal government doesn’t deserve all the blame. We have seen declines in total postdoctoral fellowships awarded in several years as seen above, which we can attribute to funding issues. Universities and provincial governments also deserve some blame, as they’ve flooded the market. But whatever the root causes, we’re seeing a major issue of human capital in the data above. This affects all of us: whether you’re a military historian, a social historian, a Conservative, a Liberal, or a New Democrat. If we really care about history, let’s put our money where our mouth is and help fund the next generation of historians. It affects junior scholars most of all, but also senior scholars. This is the future of the profession. A return to 2004-05 success rates would mean 62 more postdoctoral fellowships would have been awarded this year (244 out of 903 would have been a 27.02% success rate, which we had in 2004-05). It’s getting harder to commit history. Success rates for ALL SSHRC programs are going down. Their core budget was effectively frozen for the past 15 years. All new money came with strings: INE, Environment, Northern Communities, etc. And while some of that new money was allocated to post-docs, it probably didn’t affect the overall success rate very much. Then in the past 2 years the federal budget has required them to reallocate some of the core budget to targeted programs, effectively cutting the core budget. The post-doctoral fellowship program was always a small program, instituted back in the ’80s when there was a labour market issue on the assumption that it would be temporary. The demand has risen considerably, as your graph very neatly shows, but the only way to fund that demand would be to take money from other programs. All other programs have also seen a rise in demand. Part of the problem is that there are a lot of academics, especially in the humanities, who think that post-docs are not really a normal part of the career path. Many still believe that the best and the brightest will go straight into tenure-track jobs and that the problem with that particular transition is not really solved by more post-docs. This also puts pressure on PhD students as many try to make sure they have what it takes to get a tenure track job straight out of a PhD instead of assuming that some of that could be gained through a post-doctoral appointment. While there isn’t much that can be done about what SSHRC has available to fund post-docs academics could think more creatively about how they work and how they use their own funding (including SSHRC research grants) and how they allocate institutional budgets. Those at small universities, for example, frequently wonder how they can do projects comparable to those at research intensive institutions when they don’t have graduate students. Unless I suggest it, they rarely even think of budgeting for a post-doc. And yes, those success rates are low, too. The concern about the the governments priorities is probably not as serious. Although it shapes how much money goes to the funding councils and some broad areas that can be funded with that money, peer review ensures that the actual decisions are made by other academics who largely share you your academic concerns. The big issue is that the current government clearly does not like research of any kind and is reducing funding for it wherever it is done. Despite their focus on research that helps business, for example, they are reducing funding for agricultural research that would improve the business outcomes of farmers and others in the agricultural sector. This is the big problem. Thanks for showing how all this plays out for historians though. It is important to know just how hard it is to do research at the moment. Thanks, Jo (just to echo what I said on Twitter)! I think this really helps set the small amount of data I’ve provided here into a bigger picture, and are good points regarding postdocs in general.